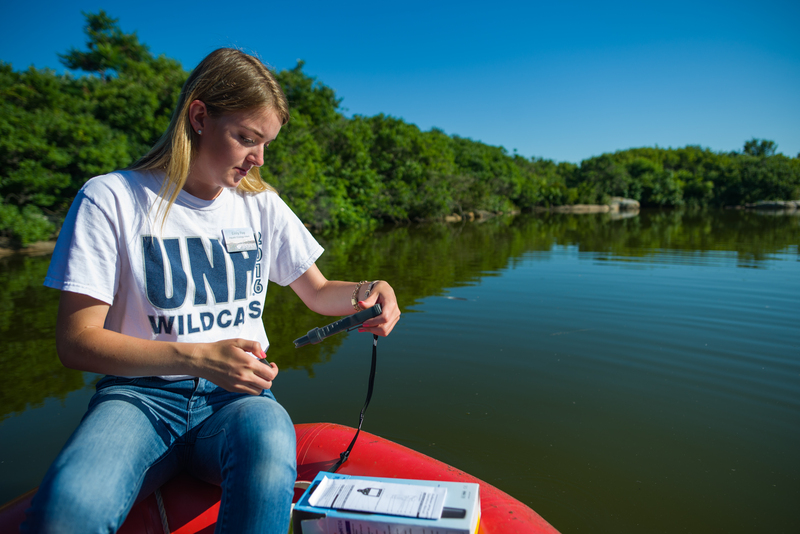 Emily Ray ’20, a marine estuarine and freshwater biology major, came to UNH with a strong interest in studying shark behavior, but shifted her focus to cyanobacteria in freshwater lakes after working in Professor Jim Haney’s lab. Airborne toxins from cyanobacteria blooms have been linked to health problems and diseases like ALS and Alzheimer’s in humans, and Ray wants to understand how the toxins get into the air in the first place. Last summer, she spent 10 weeks at Shoals Marine Laboratory, the nation’s first and largest undergraduate marine laboratory, as a paid aquatic ecology intern studying Crystal Lake, one of the few permanent standing bodies of fresh water on the Isles of Shoals. Ray and her team discovered cyanobacteria in the lake. Ray is also majoring in neuroscience and behavior. The busy Cincinnati, Ohio native says the two majors combined with the many other opportunities at UNH are giving her a solid foundation for a successful future. Emily Ray: My sophomore year, my lab partner Hailey Carter and I were chosen to give one of eight oral presentations at the COLSA Undergraduate Research Conference. I am so passionate about our research and having the opportunity to share our hard work with the students and faculty at the URC was such a rewarding experience. Ray: I want to make a difference. Whether it is volunteering at Portsmouth Regional Hospital or researching toxic cyanobacteria blooms, I love knowing that I am helping people! Ray: I am interested in sensory systems and behavior, especially in marine animals such as sharks, so combining a marine, estuarine and freshwater biology major with a neuroscience and behavior major gives me a solid foundation in marine systems and marine organism anatomy as well as animal behavior and sensory biology. Ray: I plan to go to graduate school to research sensory systems and eventually go to medical school to become a pediatric neurologist. Ray: At UNH I participate in independent research funded by a Hamel Center Undergraduate Research Award, hold leadership positions in clubs, intern at Health and Wellness, and am a Career Ambassador with the St. Martin Career Exploration Office. Having the opportunity to be involved in so many different things at UNH has given me a wide range of skills from technical lab skills to soft skills like communication and leadership. These varied experiences along with the guidance and support of faculty mentors are preparing me for success in my field. Ray: Get involved! Whether it is research, an internship, or a club, getting involved on campus has made my UNH experience amazing. Ray: There are so many different kinds of opportunities available to undergraduates! No matter what your interests are, the faculty are always willing to support you and your goals.